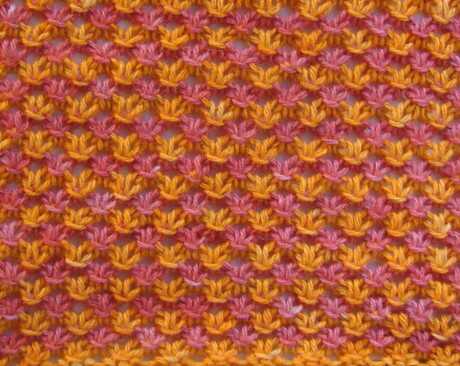 Two-Color Star Stitch, originally uploaded by judiper. Stitch Count Repeat: Multiple of 3 sts. WOW! I love your colors with this stitch pattern. FABULOUS. Very beautiful work. The color are just perfect. I really like this, it actually looks like 3 colours because of the depth, we’d have never seen that in a black and white picture. Those colors are definitely my cup of tea. I will be copying you. Thanks for telling us what flavors you used. Lovely! Very nice work with the dye. Shows the pattern well. Wow, that’s really very pretty! I like the color combination, too. Wow! I really like this color combination with that pattern! I never would’ve thought of using those two colors together – great job! really nice. I love the depth and texture with the colors.